Here it is the SEGA SJ-200 handheld Joystick. 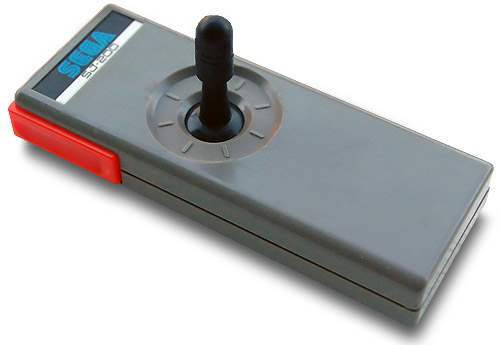 This was the most popular joystick for SEGA SC-3000 computer or SEGA SG-1000 console. Compact and ergonomic design, fine and very elegant. You can handle with both right and left hands and control your games as you wish. 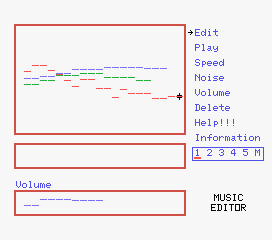 The fire buttons are easy to push by thumbs and pointer finger while with the other hand you can control the stick. A very good product, which is compatible with many 8bit systems with a 9 pin Atari-like joystick socket, the only difference is that it has two separate signals for the fire buttons. The architecture of the SEGA SJ-200 was very simpleand it's compatible with almost all computers/consoles that mounts a compatible Atari joystick. This is the pinout scheme for a SEGA SC-3000 joystick socket. You can use almost every other joystick which present this plug. All SEGA Joysticks and Gamepads have ATARI 9 pin plug and are compatible with SC-3000. Other ones, in most cases, even if they present 2 fire buttons, they have just one fire signal on pin 6 ( LEFT Trigger ) connected to both buttons. Drawings of the SEGA SJ-200 Joystick. These are the views of the SEGA SJ-200 joystick. It's a bit old fashion compared to the line of the SEGA SC-3000 computer. Actually, this joystick was inherited from the game console SG-1000 that it was designed for. Australia: distributed by John Sands. Japan and Other Countries: distributed by SEGA. The SEGA SJ-200 comes in a small box. Inside you can find the only the unit inside a transparent plastic bag.